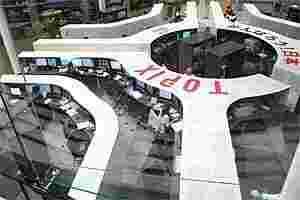 Tokyo: The Tokyo Stock Exchange (TSE) and Osaka Securities Exchange Co Ltd (OSE) announced on Tuesday they would merge to create a $3.9 billion bourse to cope with sluggish market conditions in Japan and build scale amid a flurry of global exchange consolidation. The deal will create the world’s third-largest bourse with a market value of listed stocks totalling $3.6 trillion as of the end of October. That trails only NYSE Euronext at $12 trillion and Nasdaq OMX Group Inc at nearly $4 trillion, according to the World Federation of Exchanges. The two bourses sill have complementary strengths, with the TSE controlling more than 90% of cash equity trading volume in Japan and the OSE ranking as the top player in Nikkei index futures and other derivatives. “The TSE is strong in cash equities and the OSE in derivatives. This will create a well balanced exchange," said Sadakazu Osaki, a senior researcher and exchange expert at Nomura Research Institute. “Competition among exchanges globally is also tough and they needed to take action to become more competitive." The two said they would merge operations in 2013 after the larger but unlisted Tokyo bourse buys up to two-thirds of the listed Osaka exchange in a public tender offer. The TSE will offer ¥480,000 per share, or a 14% premium to Monday’s closing share price. Shares of OSE, where companies such as Nintendo Co Ltd and Murata Manufacturing are listed, rose as high as 5.5% before paring gains to 2.9% by 9.30am. The OSE will keep its listing as the surviving entity after the merger.